Introducing the Necronomideck, inspired by H.P. Lovecraft’s Necronomicon. It is creepy, gory, phantasmagorically otherworldly horrifying with a sense of fiendish perverse nightmare, and most of all uniquely visually striking. Conceived in the Deranged Mind of mad man JW Hollibush whose first choice of Artist was, JL Rey ‘Phlegeton’. 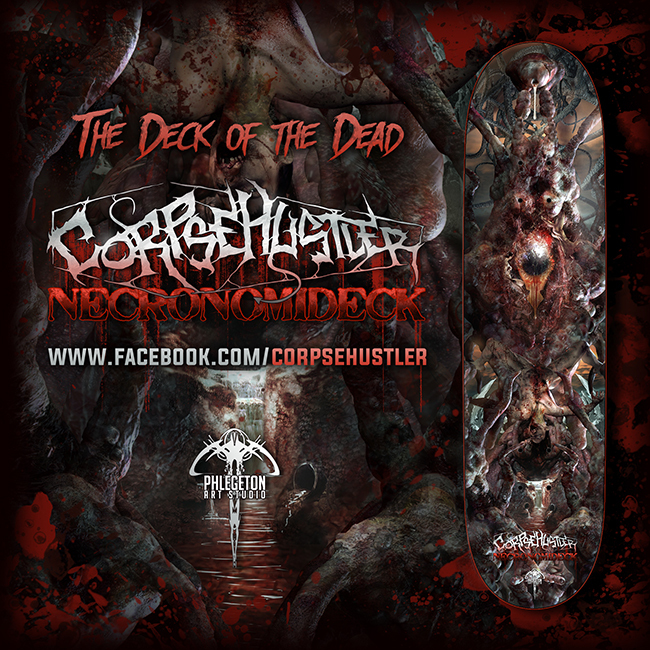 The two became linked across the globe via telepathic mastermind alliance to co-create the most perverse disturbed version of Corpsehustler Skateboard’s first version of their flagship Necronomideck. Never before has a skateboard brand put such imagination into the creation of their branding, and that shows what a dedication will be taken to make our mantra “American Action Sports Excellence” mean so much more than the generic mission statement of many corporate entities. Corpsehustler is a different type of Entity all together, put simply this brand has soul, and Infinite Individuality, which is what we believe make Skateboarding the amazing sport that captures the minds of young and old across the world, and will do so for many generations to come. Tags: corpsehustler, horror, lovecraft, necronomicon, skate, usa.